As we were walking back from Parson's Beach in Maine the sun was creating the most beautiful light reflecting in the salt marsh alongside the road. I asked Abby and Thomas if they would care to take one last photo as their engagement session was coming to an end. I'm pretty sure I put a "pretty please" in there too. 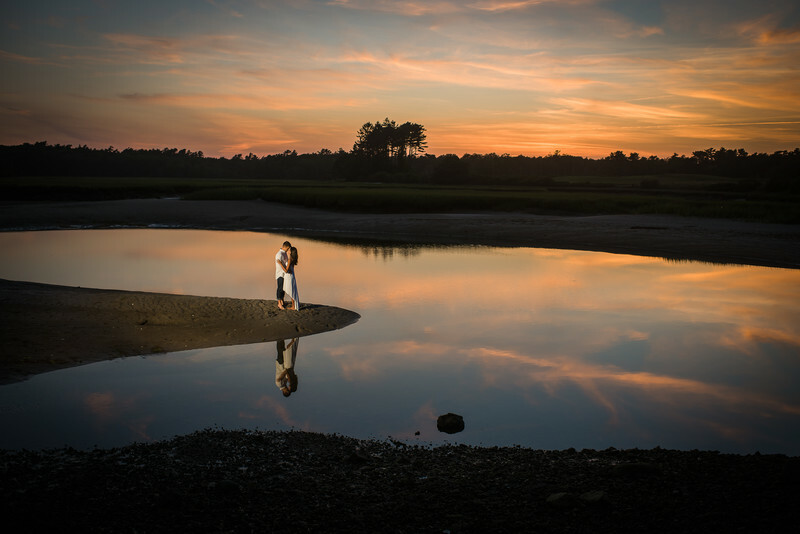 The lighting was so lovely and I know the stillness for the salt marsh would make the most amazing reflection. I placed them in a closed pose and used a small strobe with a full CTO gel to illuminate them. Here is the final image. It was definately worth it! Keywords: beach (21), Engagement Session (72), Joshua Atticks Wedding Photography (249), Kennebunkport (33), Maine engagement (45).